Researchers at AMBER and the School of Physics, TCD, discovered a method of creating wearable sensors by adding graphene to rubber bands. 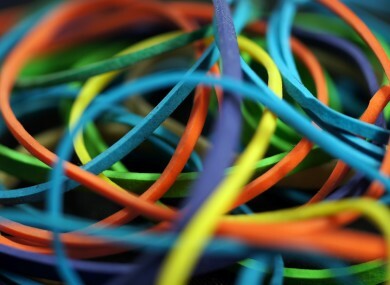 ORDINARY SHOP BOUGHT rubber bands can be transformed into wearable health sensors, according to new research from Trinity College Dublin. Researchers at the AMBER materials science centre found that by adding graphene to the bands, they could make them into wearable sensors that monitor blood pressure, joint movement, respiration and blood glucose. This is the first time this has ever been achieved worldwide. The findings have been published in ACS Nano, a leading international nanoscience publication. The bands could be used in the automotive industry (to develop sensitive airbags); in robotics, in medical device development (to monitor bodily motion), as early warning systems for cot death in babies or sleep apnoea in adults. They could also be woven into clothing to monitor athletes’ movement or for patients undergoing physical rehabilitation. Because rubber is available widely and cheaply, this unique discovery will open up major possibilities in sensor manufacturing worldwide. Email “A rubber band can be used to monitor health issues ”. Feedback on “A rubber band can be used to monitor health issues ”.